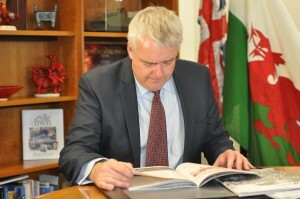 A new publication has been launched, to give details of First World War Centenary commemorative events around Wales. 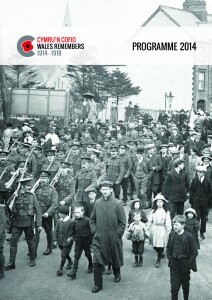 To see the Cymru’n Cofio Wales Remembers 1914-1918 Programme 2014 click here. The brochure is the first in a series of annual publications which will detail the First World War Centenary commemorative events that will take place in Wales, or further afield if relevant to Wales. It also contains in-depth articles about various commemorative events and projects. The First Minister will be hosting a National Service of Remembrance at Llandaff Cathedral on 4 August to mark the Centenary of the outbreak of war. A dedication ceremony for the Welsh Memorial in Flanders in Langemark, Belgium will take place on 16 August. The new memorial will commemorate all those of Welsh descent who took part in the First World War. Our national institutions also have a number of events planned, and projects underway to enable the people of Wales to learn more about the causes of the war, which had such far-reaching effects on the Wales we see today. People around Wales are being encouraged to attend these events, to arrange their own, and to share their plans via the Cymru’n Cofio Wales Remembers 1914-1918 website (www.walesremembers.org). The website now offers a new and enhanced Events Calendar where you can find events locally and nationally via interactive mapping and add your own planned events. Information about the centenary and events can also be found on Twitter: @walesremembers and Facebook: Cymru’n Cofio Wales Remembers 1914-1918).